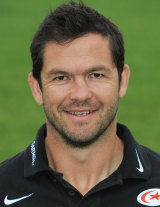 Andy Farrell played at the highest level in both codes before easing into coaching where he quickly established himself at club and national level. The rapid rise in his stock was further emphasised by his place in Warren Gatland's backroom staff for the 2013 British & Irish Lions tour. He came to rugby union after a high-profile career in rugby league, switching codes to Premiership side Saracens in 2005. He made his league debut for Great Britain aged 18, while playing for Wigan, and became the youngest player to captain the side aged 21. At club level he won five championships and four Challenge Cups before switching codes. He missed his first season with Saracens through injury but became a regular in the first team after his return to fitness. Following an initial debate about whether he should play centre or flanker, he soon settled into a midfield role and made his England debut against Scotland in 2007 and was also part of the squad that reached the final of that year's Rugby World Cup in France. He served as Saracens' co-captain for the 2008-09 season but chose to hang up his boots at the end of that season before embarking on a coaching career. He served initially as a specialist skills coach and having been tipped as a future England coach by Sarries boss Brendan Venter, he went on to work with the Saxons under Stuart Lancaster. He was later appointed as Saracens' first team coach, helping them to the 2010-11 Premiership title, and when Martin Johnson quit as England manager in the wake of a troubled 2011 Rugby World Cup campaign, Farrell was seconded to form part of the interim coaching team for the 2012 Six Nations alongside Lancaster and Graham Rowntree. He initially refused a full-time appointment with England but changed his mind and signed a three-and-a-half year deal as backs and defence coach in the summer of 2012. His impact on England and burgeoning reputation around the game, led to him being named as one of Warren Gatland's three coaching assistants for the British & Irish Lions tour of Australia.